« Poll: When looking for a new job, from whom do you prefer to seek assistance? REC Technology held a successful Summer Dinner at the Haymarket Hotel last night with guest after dinner speaker Quentin Letts, journalist and commentator, providing a great insight to the machinations of our political class. Nearly 50 invited recruitment company MD’s shared the wisdom of Oracle speaker Nigel Virgo and the entertaining Quentin Letts. Lead by REC Technology Chair, Jeff Brooks, the group discussed the possible green shoots in the recruitment market. Quentin was chastised by Jeff for thinking that all recruiters worked on a 10% margin. 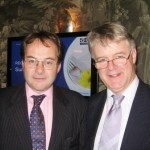 Pictured are David Smith, Vice Chair of the sector group and Quentin Letts.